Heat an oven to 200 degrees F.
In a very large bowl, combine the first 7 ingredients. In a small saucepan, over low heat, melt the butter, syrup and sugar. Take it off the heat and add the pumpkin and vanilla. Stir to combine. Add the melted pumpkin to the dry ingredients and combine. Place onto the baking sheet and spread it out as much as possible. This may take 2 baking sheets depending on their size. 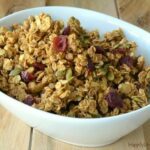 You want the granola to dry as it cooks and it won’t if there’s too much on the pan. Bake at 200 degrees for 90 minutes stirring once or twice.